Text Converter 1.0 is a useful little program for encoding and converting text to various formats. This is useful for sending coded messages to your friends, solving puzzles involving such messages, and more practical things such as decoding a Base64-encoded string found in a URL. SUPPORT STATUS: This program is actively supported. You are encouraged to send suggestions and bug reports to the developer. As seen in the screenshot above, Text Converter contains two text boxes. The left one is for the source text, and the right one is for the destination text. When you click "Convert", the text in the left box is converted from the source format to the destination format, both of which are selectable via the dropdown box above each text area. The "Swap" button will swap the contents of the left and right text boxes, and the "C" button beneath each one will clear its contents. A very important step in using Text Converter is determining the source format. If you want to encode the string "This is so cool", which is in plain text, into binary, you must set the "Source format" dropdown to "Plain text" and the "Convert to" dropdown to "Binary". If, on the other hand, you receive the string "48 65 6c 6c 6f" and would like to decode it back into plain text, you must choose "Hex" from the "Source format" dropdown (assuming you know that the string is encoded in hex – otherwise, you will need to determine the appropriate value by trial and error), and "Plain text" for the "Convert to" dropdown. As can be inferred from its name, Text Converter is designed to convert text from one format to another. The purpose of the source and destination format settings is to allow you to convert from, say, Base64 to octal in one step. Keep this in mind when attempting to convert the Base64 "Tm9va2tpbi5jb20=" into binary. If you set the source format of the string "Tm9va2tpbi5jb20=" to "Plain text", Text Converter will treat it as such. Thus, upon decoding the binary string to plain text, you will get the Base64-encoded string as opposed to the source string. This is a useful encryption technique (multiple levels of encryption), but this feature is often seen as a bug. For some conversions, such as binary, octal, and hex, you can specify the format of the resulting string. The strings "61 77 65 73 6f 6d 65", "617765736f6d65", and "%61%77%65%73%6f%6d%65" are identical in meaning but differ in the padding of characters. Note that you need not specify this option for the source string, since any padding characters are automatically stripped by Text Converter. The ROT13 and NOT algorithms, by design, are reversed by applying the same formula to the encoded text. For this reason, you will get the same result if you are converting ROT13 to plain text and NOT to plain text (and vice versa). However, as mentioned above, you can still take advantage of the "Source format" option when converting NOT to binary, for example. Also, the NOT algorithm is not to be trusted in most cases, unless it is encoded (as plain text) into another format immediately. 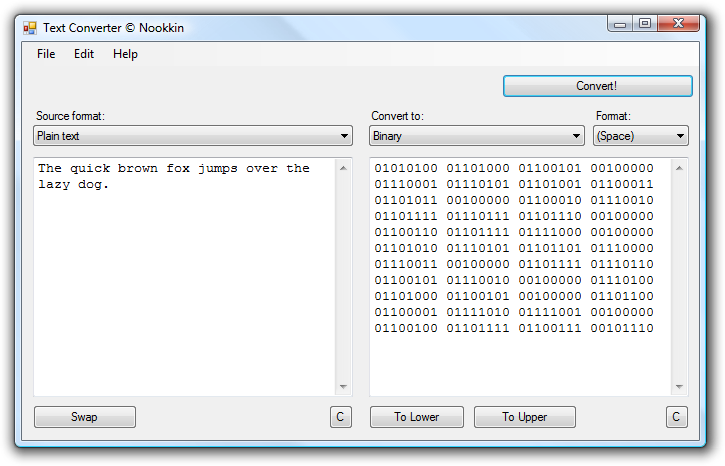 Since it simply inverts the bits in each letter's ASCII value, some letters may turn into non-printable characters. The character ÿ will be transformed into a NUL byte, which may cause the text to cut off after that point due to the design of null-terminated strings. The "To Lower" and "To Upper" buttons below the right textbox can be used for changing case. This is purely for aesthetic reasons, and is only useful for changing the appearance of the alphabetic portion of hex characters. Note that this will also serve the purpose of converting plain text to upper and lower case, although you must use caution because it is impossible to recover the original casing of the text. You are allowed to use Text Converter with virtually no restrictions. However, you may NOT use this software as part of your own projects or compilations without permission from the developer. I was looking all around for a notepad program with the ciphers added, but yours is even better side by side. Very nice and easy. The "CryptoFox" plugin has more features, but it is cumbersome, I don't like it. I suggest that you add a "ROT13+3"
The "+3" would mask numbers by adding 3 to every numeral. "Hi, my phone number is 54-3434-179"
"Uv, zl cubar ahzore vf 87-6767-402"
I tried to download, but the link doesn't work (I get to your custom 404 page). Kindly fix, as I'd like to try this program. @Michael L. It should be working now... I was migrating stuff to a new server. Hi, I liked very much your software! Is it possible for it to remember the last configuration (source and destination format) instead of always suggesting Plain text for both cases? Also, it'd be great a list of "last converted staff", either in the current session or as a history saved in the disk.